Sometimes I see bloggers do a “get to know you” picture&post on Instagram for their new followers. 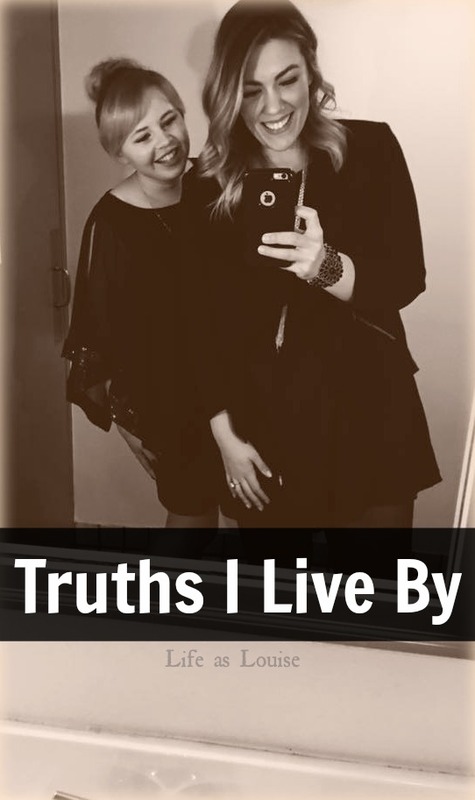 While I don’t believe there are many new people revolving through the doors of Life as Louise, I thought I might start 2017 with a list of “truths.” Or just random things I abide by. First and foremost, a quick reintroduction. Other than those basics you should know that I love all dogs, red foxes, & Harry Potter. I love reading, but I’m not the bookworm I used to be. I drink coffee every morning, I eat my veggies, and I’m a huge fan of traveling, although I’m a little iffy around airplanes. (It’s fine. Hand me a boarding pass and I’ll get over it. ) I identify as Christian and human. That said, I prefer animals to Homo sapiens 98% of the time and I truly believe it takes all kinds of kinds. I will judge you by how you treat animals. I don’t like judging others, but I can’t help it. If you swerve to hit a groundhog (I’ve seen someone do this ) or you leave your dog out in subzero degrees, I will 100% judge you. And I won’t like you. And also I will steal your dog and re-home him. You don’t have to share every lost dog post on FB (although I do ) and you don’t have to be a vegetarian, but you need to respect animals. We were made to coincide with other living things- I don’t jive well with those who have a superiority complex. All of our stories end the same. Bad things help us recognize the good. If we lived in a world where nothing bad happened I wouldn’t be upset, but that’s just not the case. Like most people, I lose and gain faith in humanity every day. The important part is gaining that faith back when all seems broken or lost; picking ourselves up and finding the motivation to fuel our next move. When I was younger I watched my cousin have a meltdown about leaving our grandparents’ house. I tried to explain to her that if she never leaves, she’ll never feel that joy of arriving again next time! My entire family looked at me like I had a second head, but I stand by that ideology. Bad things happen & we often have to do things we don’t like… but it makes the sweet moments sweeter. Respect & kindness are my religion. Well… technically I have a religion. But everything I personally believe is rooted in respect for all living creatures and the spreading of kindness / love / grace to those creatures. I am loyal to a fault. I will always pick on and tease those I love most, but deep down I would put everything on the line for them. And in a friendship or relationship, I naturally expect the same loyalty. I’m not lying when I say I would jump in front of a moving truck for K or Enzo or my best friend or my mom. I would. And when my brother’s heart was broken by girls throughout the years… Lord help those ladies when they crossed my path. I still glare at my best friend’s ex when I see him around town. They broke up +5 years ago and she’s waaaaay over it. be kind to my restaurant server, bus driver, crossing guard, etc. remember that rude behavior and nasty gossip will get me absolutely nowhere. always say please, thank you, you’re welcome, and excuse me. Nothing earth shattering or mind blowing, but if you’ve ever wondered what makes me tick, those are the core things. We all have them. Tell me about your “truths”! *Fun fact: I hate the phrase, “Live your truth/Live your best life.” Maybe I should’ve called these mottos? Or values? I can’t get past the first one. You saw someone swerve to hit an animal? Horrifying!! I am not a vegetarian – I like eating meat! But I prefer to eat animals who have had a good life if possible, and yes I am willing to pay more for it! Yep. I was just a kid and it made me pretty angry. Fortunately, he missed the groundhog. I agree. I do eat meat, but I try to be conscious of how the animal was treated and where the meat came from when I can. Thanks, Elyse! You’re the first person to say anything about it! Ugh- I was a kid when it happened but it totally stuck with me. People are terrible sometimes. YES to number one. How you are to animals is a good indicator of how you are to humans. And I try to be kind to everyone. In fact, when I did a post like this, one of my items was that I don’t care what you do for a living, if you’re a nice person, we’ll get along. I’m loyal. Until you screw me over. Then we’re done and there’s no coming back from that for you. I once saw a meme that said, “I judge people on how they treat animals, the way they talk to their waiter, and what they do with their shopping cart.” I 100% agree with that meme! Ha. Lol I feel the same way about my best friend’s ex. They broke up at 18, we are now 32, they are both married to other people and have babies. But he went to college with me and is thus married to someone who lived in my dorm and is friends with my friends, and I’m STILL not nice to him. I probably never will be! Yep! I was crazy protective of my little brother in high school. Now I’m like a bulldog for my best friend and K and my parents. Haha. I usually forgive offense against myself, but I rarely get over something done to my family or friends. I just told someone the other day how I judge people by the way they treat animals. It says a LOT about a person. More specifically, when people come to our house I totally judge them by how they treat our dogs. Ha. Oh goodies- we’d be on Target/Starbucks dates every week if we lived near each other! I will have to check out that book! I’ll add it on GoodReads so I don’t forget! Whaaaaattt …. someone intentionally swerved to hit a groundhog? Why in God’s green earth would someone do that? I judge people by the way they treat animals (I am the kind of person who says hi to dogs first before the human walking it) and people in general, but especially waiters/cashiers. I always make a point to make sure that I look them in the eye when I speak to them because I realized I used to mumble my thanks and so on as I dug through my purse looking for my credit card or money. They deserve to been seen. “Respect and kindness are my religion” – AMEN to that! And of course Harry Potter rules! I’m glad to get to know you a bit better since I am a relatively new follower and more importantly you’re just as awesome as I always thought you were! I’m glad you enjoyed the post, Tanya. Thank you so much! I was a kid when it happened and it was one my dad’s backwoods friends- but that’s no excuse and it made me so angry! Fortunately, the groundhog got away just fine. I can’t STAND it when people are rude to servers or drivers or stewardesses or any public service worker. Society would crumble without the people in those positions! This is such a fun idea for a post! YES to being kind to other people. I really try to be kind to everyone because it’s just rude to be mean to someone for no reason. I live by “Do what you say you’re going to do.” I CANNOT handle people who say they are going to do something (attend a party, return a book, send you a gift) and then don’t actually do it. I try very hard to be a person of my word and do what I say I’m going to do. Thanks, Amanda! That’s one of my husband’s things, too. Doing what you say you’ll do and being on time. He’s a stickler on that 🙂 I slip sometimes, especially when it comes to social functions, but I try to follow through with everything I say I’ll do! haha i thought i was the only one who takes loyalty too far. if someone treats my friends or family badly, they get my wrath even if i don’t know them or they’ve done nothing wrong to me. case in point: a person who works here treats everyone like crap, including my husband. we know one another but i’ve never had any direct contact with her but whenever i saw her, i’d legit ignore her and say hi to everyone else. i’d walk right by her in the hallway and act as though she wasn’t there. if she got in the elevator with me and it was just us two, i’d pretend that she wasn’t even there and wouldn’t say a thing. if she smiled at me, i would just ignore it. Hahahahahahahaha! That’s awesome. Seriously, though. Treat my husband (or bff or parents or brother) badly and you will be the target of alllllllll my wrath. Ummmm. Totally not weird at all to say that! Hahaha! Definitely had no doubt we’d be on the same page! From this post I totally get why I am so drawn to your blog and why I think we would totally be hanging out if we lived closer. I love your attitude towards life and I love your philosophy about being extra kind to everyone you meet. Also, I am slightly jealous that you and your husband get to work together every day. This morning I was thinking about how Nick and I really have no idea what each other’s days are like. I’m not allowed to see where he works so I can’t even visualize it! Yes, yes, yes to your mother-in-law!! It speaks volumes that the pup a) sought out your m.i.l. and b) she took him in and loved him!! Whoa… that’s crazy! My mom is a teacher and my dad is a truck driver (for the family business), so I used to tag along with them when I was a kid. Kinda weird not knowing anything about where close family members work! I’m glad it’s going so well for us. I was honestly really worried about spending all this time together, but it’s been great (and we’re so absorbed in our work we don’t really chat all day). We still value that together time on the weekends, thankfully! You are wise, my friend! I love all of these things you stand for and believe in. I especially love the animal one. No surprise there! Whew, “wise” is a serious compliment! Thank you! Animals will always be held in a high regard in our house 🙂 I super love my husband because he’s the same way! You and me both, Louise! I absolutely love and agree with the bonus items you put on your list. I’ve always believed that doing the smallest, trivial kind things comes back a thousand-fold. I have a feeling we’ll get along very well if we ever meet in person! I just can’t stand seeing people be rude or hurtful toward others (human or animal). When I notice other people at restaurants being mean to servers (especially ours) I always try to tip a little higher to let them know they’re loved and we appreciated their service. Yes. Yes yes yes ! Thanks, Emma! And EXCELLENT post today!! I definitely judge people on how they treat animals too. #2 is so true. I’ve been really feeling that lately with the sudden passing of my best friend’s mom. We had quite a few funerals/calling hours in 2016, ending with one for a close friend/mentor of my husbands. I’ve always hated death so, so much- at least since my aunt unexpectedly passed eleven years ago. Lately I’ve changed my tune a little. (Sometimes I think it worries K.) I am always so, so heartbroken for the family members left behind, but as far as death goes, it’s 100% guaranteed. We can’t stop it. Something is going to take us from this world- a car crash, cancer, old age… It’s just so black and white for me. That said, I always feel so sad for the family and friends still here. I truly don’t want my kin to feel that way when I go. I know (hope) that I’m headed somewhere a million times better than here, so I’m not sad about it. We’ve just got to do what we can and love fully while we’ve got the opportunity! YES. To all of this, but especially to the statement about respect and kindness. Why are those traits so difficult for people? It costs you nothing to just be nice and treat others the way you want to be treated. Yes! It absolutely costs us nothing!! Patience and kindness will always pay off. I love this. Especially the part about identifying as a Christian and rooting those beliefs in kindness, grace & love to all creatures. first – i am sorry i’ve been away for so long on your blog so i must say I LOVE THE NEW LAYOUT! i adore trees and especially the one at the top. also great blog post – i so so relate with loving travel but not actually the airplane part but whatever…we will just live our truths 😉 haha that fun fact also totally cracked me up! Hey- you’re living life! Don’t apologize for that! 🙂 The layout is pretty new (not even a week old, I think?) so you didn’t really miss much. I wish I wasn’t squirmy on planes (and I didn’t used to be), but it’s something I guess I can live with. Ha..
Alicia Keys uses phrases like that ALL THE TIME on The Voice and K makes a mental note of them and says them throughout the week to irk me. Drives me INSANE. Hahahaha. Ha, I’m good with flying comments 🙂 Thanks! I agree! Ha! i totally judge people on how they treat animals (and servers, and kids, and older people). i love cats, i know lots of people don’t, but i can’t stand when people make jokes or go out of their way to hit them. you don’t have to like an animal, but if you try and hurt or kill it? bye felicia. If you try to hurt or kill an animal chances are I’ve put you on my mental list of potential serial killers. And I need you to get away from me. Ha. I am definitely a dog-mom and I love my babies to death, but I grew up with my kitty and I never pass up the opportunity to cuddle with cats (assuming that want it at that particular moment in time…).